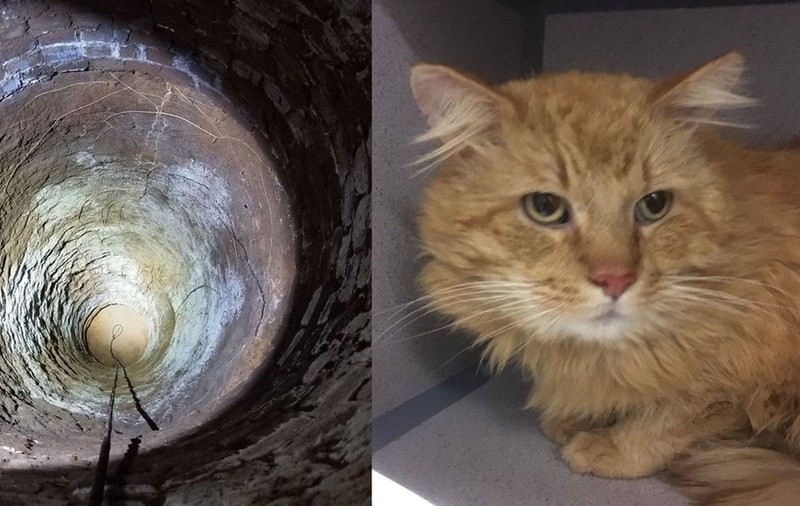 The police department billed the story as ‘an old well, a stuck cat and a crazy rescue'. A cat has been rescued one week after worried residents reported hearing miaowing from somewhere near their homes. The adventurous ginger tom cat had got himself stuck at the bottom of a 40ft dry well underneath a house. One homeowner, in Grass Valley, California, initially got in touch with police and animal control because they could hear miaowing even though they didn’t own a cat. Animal control officer Caralyn Davis responded and searched the area but couldn’t locate the mystery animal. She returned a few days later for a follow-up visit. “The ‘miaowing’ persisted over the next several days, so on Friday, Caralyn went back,” Grass Valley Police Department explained in a Facebook post. “Upon further examination, she and the homeowner located a very old, dry well under the house that was about 40 feet deep. Convinced the cat was stuck at the bottom of the well, the dedicated officer kept returning to check the trap. One week after her first visit she found the hungry cat was safely in the trap and the officer could heave both the trap and cat to safety. The ginger tom is now with Grass Valley Animal Control.